An agent of Dunryd Row attempts to perceive a "housed" soul within a piece of evidence. Hello and welcome to today's class update! We'll be discussing some newcomers to the Dyrwood's "magic" scene, the enigmatic and deadly soul-manipulators known as ciphers. Read on to learn how ciphers went from being an animancer's theoretical possibility, to the feared foes of Dyrwoodan settlers, to an integral part of Defiance Bay's secret police, Dunryd Row. Contemporary ciphers are fighting casters, like the Glanfathan "mind hunters" who invented the discipline. When engaged in physical combat, they use an Ability called Soul Whip to contact and drain the psyches of their targets. Recognizable by the purple flames that engulf a cipher's weapons, Soul Whip generates a Focus resource that ciphers can use to power their abilities. Though ciphers begin combat with a modest amount of Focus, their more advanced techniques demand large expenditures of Focus. Additionally, repeated uses of even minor powers will quickly drain a cipher's Focus, requiring them to dive into physical combat to generate more. Cipher powers are not limited to mental manipulation. They have abilities that allow them to use a target's soul energy to "leak" and burst into flame, to generate a physical shockwave of that knocks down everyone behind the target, or even to bend back toward the cipher, creating a field of protective energy around him or her. With the exception of Soul Whip, all cipher powers require Focus and a nearby target other than themselves, one with a "housed" soul. In practical terms, this means that ciphers must always target a nearby ally or an enemy with their powers. It is impossible for them to target themselves, a distant target, or open ground. Soul Whip (Modal) - At close range, the cipher's weapons generate fields of parasitic energy that lash out at a target's soul. The Soul Whip mode reduces the amount of damage caused, but each successful hit briefly lowers the target's Psyche defense and generates Focus for the cipher (attacks Psyche). Mind Wave - The cipher violently intrudes into an enemy's mind, Stunning the target (attacks Psyche) and generating a cone of concussive force behind him or her that can knock down anyone in its path (attacks Fortitude). Soul Shock - The cipher causes an ally's soul to "crack" and violently release energy into the physical world. The resulting explosion of electrical (Shock) energy damages everyone nearby except the target (attacks Reflexes). Psychovampiric Shield - The cipher drains Intellect from enemies and uses it to temporarily increase his or her Deflection. The increase in the cipher's Deflection is dependent on how much Intellect he or she successfully drains from victims (attacks Psyche). Mind Blades - The cipher uses the souls of nearby enemies to generate attacks against the subjects themselves. Each target is attacked once by a slashing "mind blade" which then moves on to the next nearest enemy up to a maximum of five targets (attacks Deflection). Recall Agony - The cipher causes the target to re-experience the pain of a wound moments after the target originally suffered it. The damage is a percentage of the original value, but it ignores the armor of the target (attacks Psyche). Many classes have abilities that allow the user to channel the power of their own soul or ambient soul fragments to produce incredible effects. Paladins ignite their souls to produce auras, wizards draw soul fragments into grimoires to shape and cast spells, and monks use personal suffering to focus energy through their bodies. While these classes often develop abilities that allow them to affect the minds and souls of others, the power is always generated by the user. Feared for their mental powers and extreme hostility, the vithrack were once eagerly pursued by animancers for research purposes. In the field of animancy, which focuses on the study of souls, researchers wondered for centuries if they could develop a discipline or technology that would allow people to connect with the soul of another living thing -- not just reach or strike out toward it. Wizards and priests had developed abilities to overwhelm or inspire the mind, but not to connect with it. Animancers theorized that it could be possible for one soul to reach out and connect to another, but they had no proof. Animancers studied folk legends about figures called Watchers who reportedly were able to see lost souls and perceive an individual's ancestral lives, but claimants to that title were typically charlatans at best or mentally unstable and violent at worst. A few intrepid animancers attempted to communicate with the reclusive spider-like race known as the vithrack. The creatures, obviously of advanced intelligence and extraordinary capabilities, seemed to possess the ability to connect to an individual's soul -- albeit with horrifying consequences. The dangerous nature and rarity of the vithrack combined with their inhuman physiology have still proven to be insurmountable obstacles in understanding how their powers work. Still, the animancers had a few other leads to follow. Over a century ago, during the Broken Stone War, soldiers in the Dyrwood reported wild tales of having their minds invaded, of seeing comrades lose control of themselves, of orlan and elven Glanfathan warriors wielding knives engulfed in purple flames that "cut away" the souls of their victims. The war was a new experience for everyone involved, so many Dyrwoodans dismissed many of the more outlandish tales over time. But over the decades that followed, more settlers reported similar violent encounters with Glanfathan guerilla fighters. In the War of Black Trees, Dyrwoodan animancers confirmed many of these experiences across a wide number of soldiers and settlers. 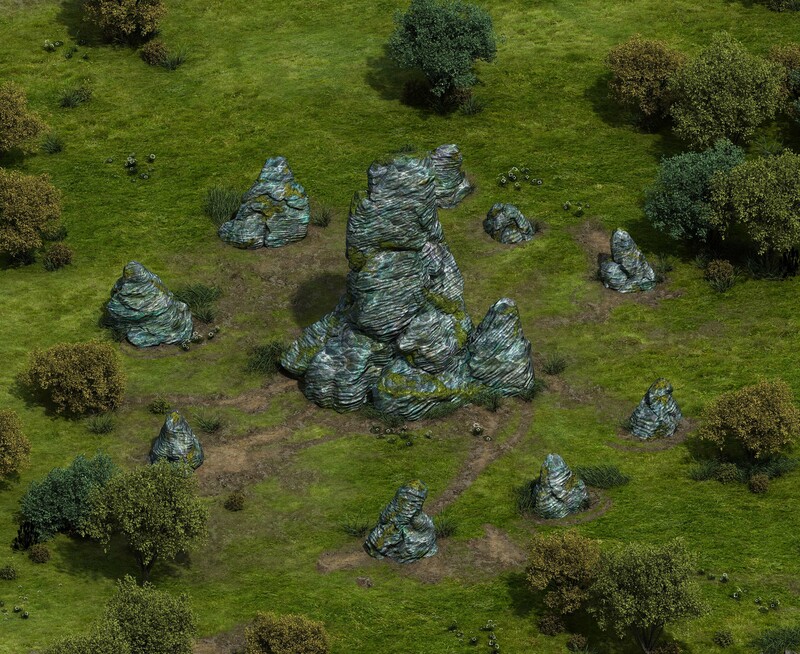 However, with Dyrwoodan settlers in a state of war with the population of Eir Glanfath, the researchers couldn't find many Glanfathans who were willing to talk about it. After the Dyrwoodan revolution for independence, the Dyrwood officially stopped the Aedyr Empire's practice of exploring and plundering Eir Glanfath's sacred ruins -- the practice that had ignited the earlier wars between Dyrwoodan settlers and Glanfathans. 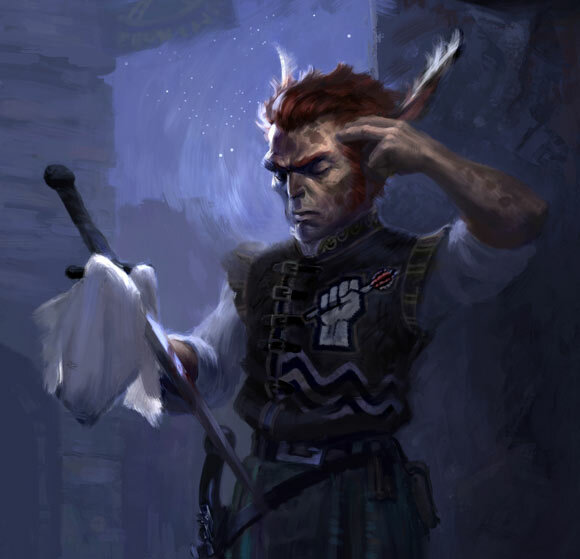 In the years that followed, the tribal princes of Eir Glanfath allowed Dyrwoodan animancers to speak with some of their brîshalgwin ("mind hunters"), the elite warriors that had terrorized Aedyrans and Dyrwoodans in past wars. From the brîshalgwin, the animancers learned that Glanfathans had developed mental abilities that allowed them to perceive and contact what animancers categorized as "housed" souls, i.e., souls held within a physical vessel. They initially developed these talents in an attempt to communicate with souls held in the Engwithan ruins they were sworn to protect. When the tribal princes outlawed this practice as disrespectful and dangerous, their councilors advised the princes to turn the efforts of the brîshalgwin towards protecting the ruins and developing new methods of warfare. Standing stones of adra like these were carelessly knocked down by early Dyrwoodan colonists, starting a conflict with the local Glanfathans that erupted into what became known as the Broken Stone War. 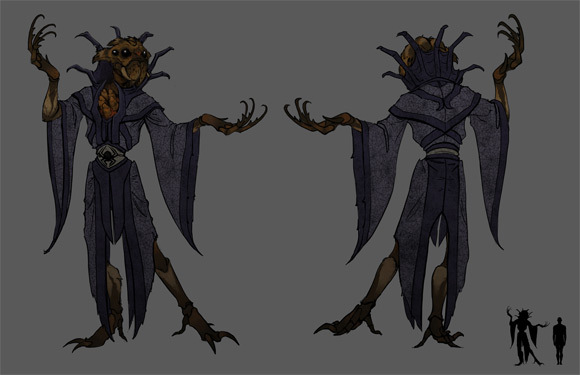 Excited by these revelations, animancers in Defiance Bay began working with the brîshalgwin, whom the animancers had previously described as "ciphers" due to their mysterious nature. Given Dyrwoodans' general discomfort with the Glanfathan language, the cipher name stuck and continues to be used in everyday conversation. For decades now, the ciphers and animancers have worked together, each generating new ideas and expanding their collective understanding of soul manipulation. Today, Dyrwoodans and foreign visitors from Aedyr, the Vailian Republics -- even distant Rauatai -- have learned and expanded the ciphers' growing field of techniques. Recently, encouraged by the potential the ciphers have shown and dismissive of the superstitious concerns of locals, Lady Webb, a prominent noble and advisor to the duc, petitioned the Dyrwood's erls to create a spy service in Defiance Bay consisting primarily of ciphers. The erls approved, creating what would become known as Dunryd Row, a respected, if somewhat feared and mistrusted, organization that operates out of an old, vine-covered house in the city's Brackenbury District. Though ciphers' powers are still being explored, unlocked, and debated across the civilized world, most people recognize that their abilities hold great potential -- for good or ill -- in the cultures that develop them. Did not expect this magic/ melee hybrid. I'm even more curious about the other casters in P:E to see how they relate to the ciphers. This class sounds really interesting. I'm not sure it will be my first character, but I definitely want to roll one of these up sometime, or hire a Cipher companion. Edited by Keyrock, 01 October 2013 - 04:19 PM. So Ciphers have to actively be involved in combat to increase their focus, does this mean they cannot use ranged weapons or some kind of purely mental attack? Oh and on an unrelated note, thank you for the early release of the last few updates, very considerate for those of us across the pond. I am an instant fan of these spider-people, the vithrack! Am I sensing a decidedly illithid vibe? Sort of wished the illi...vithracks would not be so spider-head, human body. The remind me of ancient Egyptian gods a la anubis. Edited by Hormalakh, 01 October 2013 - 04:31 PM. Yep. You can thank Bobby for the vithrack. He loves mind flayers! Would you go more towards centaur-like or straight up quadrupedalism if you were to redesign the vithrack? Edited by Wirdjos, 01 October 2013 - 04:41 PM. Interesting update! I didn't expect the ciphers to be so melee-focused, but they seem cool. The vithrack illustration is probably one of my favorites so far. Within the constraints of a humanoid design, you've done a good job of emphasizing arthropod features while still making them look plausible and not just a spider-person mashup. Each class update further develops my choice paralysis (i.e., each class sounds more awesome than the last). This is a good conundrum to have. Definitely going to be playing as this class first. Ciphers seems to be quite intresting class. Close combat magic users with ability to use enemies against each other. And I love their backgrounds story and reactivity pontential what it gives, as most people don't actually know enough about ciphers which probably mean that they will have positive or negative prejudices against them, which can lead to much different reactions when comparing to other classes. Great back story, really grounds the class with some history and a present day context, but still leaves some mystery and imagination in the mix. "Soul Whip (Modal) - At close range, the cipher's weapons generate fields of parasitic energy that lash out at a target's soul. The Soul Whip mode reduces the amount of damage caused, but each successful hit briefly lowers the target's Psyche defense and generates Focus for the cipher (attacks Psyche)." Just a suggestion, but maybe the reason this works is that the cipher is channeling his own soul into his weapon. Stabing the opponent (and their soul) with his own soul could be the reason that energy is stolen. Just an idea. "Soul Shock - The cipher causes an ally's soul to "crack" and violently release energy into the physical world. The resulting explosion of electrical (Shock) energy damages everyone nearby except the target (attacks Reflexes)." The description for this one causes me some problems... the idea that you make an ally's soul "crack" without harming them seems really odd. Maybe this is explained elsewhere in the lore, but I would expect a "cracked" soul to be a really bad thing. Maybe this should be used on enemies instead? or maybe the ally should be harmed? (high risk, high reward type thing), or maybe just avoid words with as damaging conotations as "crack"? Not really what I was expecting, but I'm still intrigued. Perhaps my Paladin will pick up a Cipher companion. Interesting stuff. Love the extra-creepy Vithrack concept art! I would think that Ciphers, with their bent for soul invading and psyche scrunching powers, would have devised some type of defenses against those same powers. No doubt they have a higher than normal psyche defense rating, but perhaps something akin to active psychic defenses that can be raised during a Cipher to Cipher battle? Anyway, great update and I'm looking forward to trying the cipher character in the game. Thanks! Edited by rjshae, 01 October 2013 - 05:55 PM. Extremely awesome update. The class and mechanics looks very interesting and I am looking forward to playing it even more now.